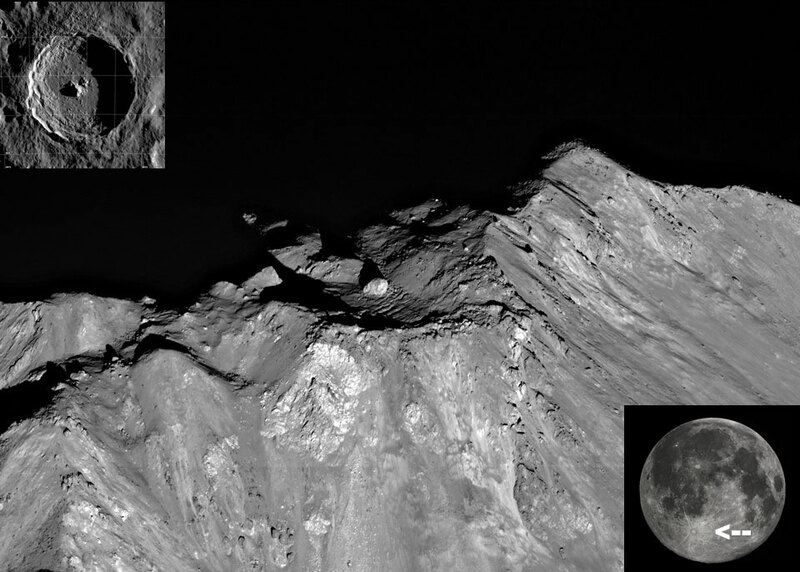 Why is there a large boulder near the center of Tycho’s peak? Tycho crater on the Moon is one of the easiest features to see, visible even to the unaided eye (inset, lower right). But at the center of Tycho (inset, upper left) is a something unusual — a 120-meter boulder. This boulder was imaged at very high resolution at sunrise, over the past decade, by the Moon-circling Lunar Reconnaissance Orbiter (LRO). The leading origin hypothesis is that that the boulder was thrown during the tremendous collision that formed Tycho crater about 110 million years ago, and by chance came back down right near the center of the newly-formed central mountain. Over the next billion years meteor impacts and moonquakes should slowly degrade Tycho’s center, likely causing the central boulder to tumble 2000 meters down to the crater floor and disintegrate.